Matt Coloured Foamex is a rigid, hard wearing PVC that is compressed and very strong. This board is coloured, with a matt finish. Foam PVC board is strong, lightweight and suitable for a variety of signage and creative projects. It can be cut to any form, size or shape with ease using your typical hand tools, and can also be heat bent and glued. 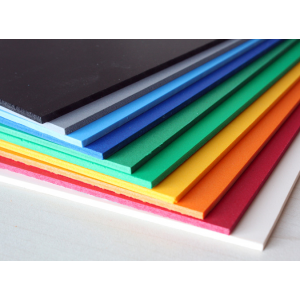 Also known as Foamalite, foam PVC and foam board, this material has an abundance of useful attributes that have made it renowned worldwide; it is used in even the most inhospitable climates. All sizes of this product are dispatched with protective film on one side. FREE cutting service*: Just tell us how you want it cut when you checkout in the special instructions box. Minimum width of cut is 75mm. Saw width is 3mm. Cut sheets have a Tolerance of +/-1mm.